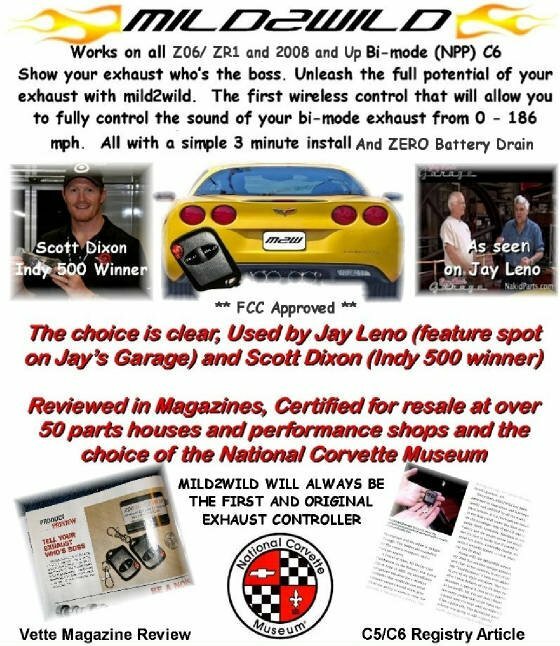 This revolutionary product lets you control your, 2013-2018 Corvette bi mode exhaust system on demand via a tiny wireless remote or the Homelink feature in your car. One of the coolest technologies is the “bi-mode” exhaust. Whisper quite up until 3500 RPM and then a wide-open race car sound as the flaps located in the tips open. This revolutionary product lets you control your, 2014-2018 Corvette bi mode exhaust system on demand via a tiny wireless remote or the Homelink feature in your car. One of the coolest technologies is the “bi-mode” exhaust. Whisper quite up until 3500 RPM and then a wide-open race car sound as the flaps located in the tips open. The problem is the inability to control this feature. Up until now, the owner’s only choice was to pull the fuse or to install wiring, drill a hole for a switch to turn the quiet mode off (and these sell for $85). After spending $75,000, the last thing I would want to do is start running wires and drilling holes. This revolutionary product lets you control your, C7 Corvettes bi mode exhaust system on demand via a tiny wireless remote or the Homelink feature in your car. One of the coolest technologies is the “bi-mode” exhaust. Whisper quite up until 3500 RPM and then a wide-open race car sound as the flaps located in the tips open. The problem is the inability to control this feature. Up until now, the owner’s only choice was to pull the fuse or to install wiring, drill a hole for a switch to turn the quiet mode off (and these sell for $85). After spending $75,000, the last thing I would want to do is start running wires and drilling holes.